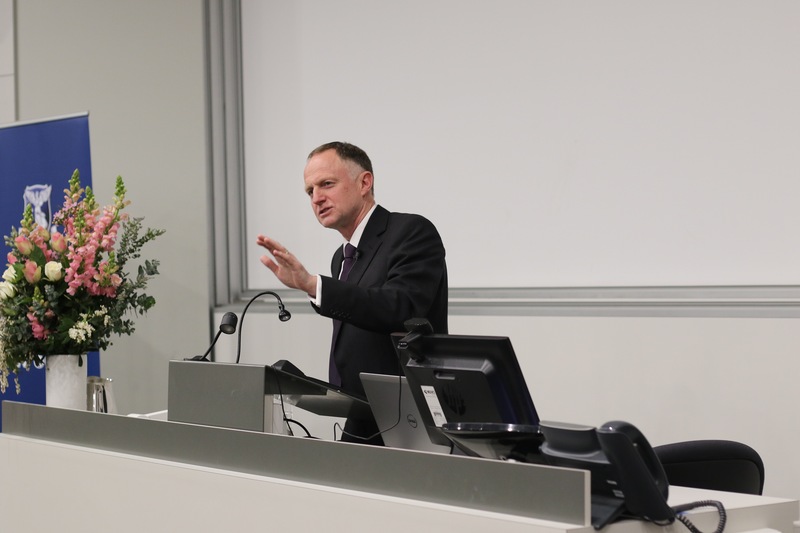 Justice Stephen Gageler of the High Court visited MLS this week to deliver the Allen Hope Southey Memorial Lecture. He took the audience through an early piece of judicial history in a lecture titled "When the High Court Went on Strike". His honour delved deeply into the Court’s archives, giving an informative and humorous lecture on a curious episode in the formative years of the Court, in which the boundaries of judicial independence and accountability were still being tested. The tale begins late in 1904, with a request by Samuel Griffith, the first Chief Justice of the High Court, for shelving to furnish his chambers in Sydney, where the High Court regularly sat. “He did not think that the shelves needed to be elaborate or expensive; about 300 feet of shelving altogether,” Justice Gageler explained. The judges also decided to maintain a circuit of hearings around Australia’s capital cities, and saw fit to be accompanied in their travels by "tipstaff" — now known as associates. The justices further requested telephones in each of their chambers. Although the Judiciary Act of 1903 allowed the Court to regulate its own practices and procedures, the reality was not as straightforward. Standing in their way was Attorney-General Josiah Symon, himself an overlooked candidate for the High Court. Symon wanted to restrict the spending of the Court, pressuring the judges to limit their sittings to Melbourne, allowing no travel expenses for tipstaff, providing only one telephone to be shared between the three justices, and refusing to fund the bookshelves. At stake was a crucial point: to what extent was the judiciary free from administrative interference from the Executive? Was it necessary to the Court’s functioning that they retain administrative independence as much as adjudicative independence? After many strongly worded telegrams, Chief Justice Griffith took the bench on 29 April 1905 and declared that all of the Court’s hearings were to be adjourned. The High Court had gone on strike. The battle was concluded only when the Government was ousted, and replaced by a new Parliament. The incoming Attorney-General, Isaac Isaacs, later to become Chief Justice himself, sided with the judges. Administrative independence was a natural characteristic of the Court. Griffiths got his bookshelves, the justices their telephones, and the Court were permitted to conduct hearings on a circuit around the country — with tipstaff accompanying.